Vicks vaporub is one of the most frequently used decongestants. It includes some active components such as eucalyptus oil, methanol and camphor. It also includes some other inactive elements such as nutmeg oil, cedar leaf oil, thymol, lemon fragrance, petrolatum, and turpentine oil. Most of you must have relied on Vicks vaporub to get rid of various health issues like a headache, chest and nose congestion, cough, cold etc. Lately, there have been a lot of talks going on about other not-so-talked-about uses of this 100 year old cream. You will be astonished to know that Vicks vaporub cream is used for treating many other health problems other than congestion. Vicks VapoRub is a mentholated ointment that is most commonly used to treat cold, cough, nose and chest congestion, minor joint pain and aches etc. Vicks VapoRub is presently manufactured in Mexico and India. These two countries do their packaging as well. VapoRub can either be used as an ointment or can be inhaled with hot steam. It should not be swallowed or applied inside the nose or mouth. Vicks VapoRub in India is made by Procter & Gamble (P&G). It has been stated as an Ayurvedic medicine by Procter & Gamble. It is also indicated in the package as such. Vicks VapoRub generally gives 8 hours of relief from cough and cold. It is not suitable for infants. It is suggested to apply Vicks VapoRub as an ointment on your temples and massage gently to get rid of headaches. If you regularly suffer from sinus headache, it is recommended that you put some Vicks VapoRub under your nose and inhale it. The vapour will give you relief from the headache. Methanol is one of the main active components of Vicks VapoRub. This ingredient helps in lowering your blood pressure and hence eases the pain. Vicks VapoRub can also help with migraine headaches. If you are having muscle aches, then Vicks VapoRub is your best bet. You can use it as an ointment and apply it on the area that is paining. After applying, it is advised to wrap the area with a dry and warm towel. Vicks VapoRub also helps in relaxing stressed and sore muscles. In case you are suffering from ‘tennis elbow’, all you have to do is apply some Vicks on the painful part and keep massaging it till the pain lessens. Ear ache can happen either because of an ear infection or can be a result of cold. Ear pain is extremely irksome and can make performing daily activities and chores quite difficult. The best way to get rid of ear pain is to take a cotton ball, rub some Vicks on it and keep it in the ear all night or just until the pain subsides down. There is another way to use Vicks to get relief from the awful pain. Heat a clove of garlic (10 seconds in a microwave), apply some of the ointment on it and keep it inside the ear. Just keep in mind that although this remedy helps you get relief from the pain, it does not cure ear infection. To know the correct cause of your ear ache, it is advised to consult a doctor first. In case your toenail is infected with fungus, you need to rub Vicks VapoRub on those infected nails 2-3 times a day for as long as it is required. Use Vicks VapoRub as an ointment and apply it on the affected toenail every night before going to sleep, cover it with gauze and then wear your socks. Repeat this procedure till your nail turns dark and the infected toenail grows out. Once the nail grows out, cut off the dark part. Keep doing this till you get rid of the entire infected nail. One word of caution is that you have to be sure your toenail is completely dry before applying Vicks VapoRub. This is the best way to use Vicks VapoRub for toenail fungus. 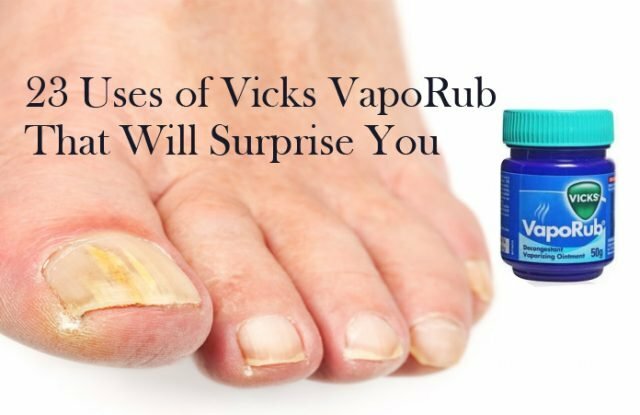 Vicks VapoRub can help you get rid of cracked heels. Apply Vicks as an ointment to the balls and heels of your feet, and then keep massaging over the damaged area. Keep repeating this procedure almost every day before going to sleep, then put your socks on and go to sleep. Make sure to use old socks as they will smell very strongly of methanol. Due to its active components like camphor, methanol and turpentine oil, it helps in keeping the moisture locked and trapped and helps in healing. Next day, rinse your feet with lukewarm water and scrub with pumice stone to get rid of dead cells. Apply a foot moisturiser after this. 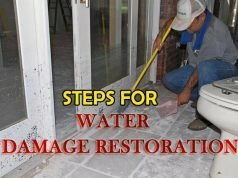 Keep repeating this process till you get rid of cracked and painful heels. It is suggested to use Vicks VapoRub in clothing lines and skin to keep away bugs and flies. The strong scent of the cream helps in keeping these bugs at bay. You can also keep an open jar of Vicks VapoRub in the area affected the most by the bugs. It is a perfect replacement for insect repellents. 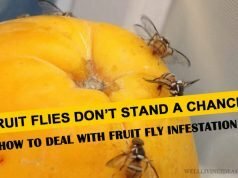 It is an extremely effective and eco-friendly trick that you can use to get rid of those bugs and flies. And if you get bitten by the bugs anyway, try applying some of this ointment onto the affected area for immediate relief from itching and pain. A combination of salt and Vicks VapoRub helps in faster blood circulation which will in turn help in healing the bruise, thereby avoiding blood clots. This will also help the bruise marks dissolve faster and quicker. In case of minor cuts, it is suggested that you apply this ointment around the cuts to help them heal effectively. However, it is warned against applying Vicks VapoRub to open wounds and damaged skin. So keep that in mind. It also helps in lessening any bruise related swelling. Vicks VapoRub helps in speeding up healing time and also helps in avoiding any possible infection. Vicks VapoRub helps in getting rid of fat from your belly. First, you will have to make a paste. The ingredients that you would require are camphor, alcohol, baking soda, and Vicks VapoRub. Mix one tbsp. of alcohol with one tbsp. of a crushed tablet of camphor, one tbsp. of baking soda and half a jar of Vicks. Keep mixing them till it becomes a paste. Apply this paste on your abdomen before carrying on with your physical exercise and wrap that part with a plastic wrap. When you are finish working out, rinse your abdomen with plenty of warm water. Apply this paste 2-3 times a day can help you lose your belly fat fast. Even if you find your pets sweet and lovable, they can be a complete nuisance from time to time. The most annoying thing that they usually do is pee inside the house. You can make use of Vicks VapoRub to avoid such troublesome incidents. All you need to do is leave some of this ointment in the places that these incidents happen more frequently. Veterans say that the strong odor of Vicks Vaporub discourages your pet from lifting up their legs and wetting your mat. This method will definitely work as neither dogs nor cats can stand the smell of Vicks. Cats are annoying furry little creatures who more than often scratch everything that they could get their claws on. 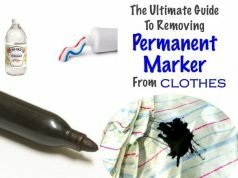 If you want to prevent your cat from scraping the color off the walls, doors, and windows, here is a quick remedy for you. Take some Vicks VapoRub and apply it on those places and your cat will steer clear of them; the reason being their intolerance for this ointment’s odor. In case your cat is prone to scratching you, you can apply some Vicks on your hands and legs as well. Stretch marks are an annoyance to many; but unavoidable as well. You can get rid of stretch marks by making use of Vicks VapoRub as an ointment. Rub some Vicks on your stretch marks. Keep repeating this for two weeks and gradually you will start noticing some change. The marks will start to fade away. Using Vicks VapoRub to clear acne is said to be one of the easiest home remedies. Apply some of this ointment onto the problem areas before going to sleep and keep it overnight. The component methanol in Vicks helps you by providing fast relief from the swelling and the pain. It clears the skin by soothing and drying the affecting area. Keep applying this ointment, and you will get acne free skin within a few days. Vicks VapoRub is very effective in warding off mosquitos. All you have to do is apply some of this ointment on your skin or your clothes to keep mosquitos away from them. If you get bitten by one, then apply some Vicks onto the swollen area and cover it up with a band aid. This will give you relief from the itching and make the swelling go away. Vicks VapoRub acts as an excellent moisturiser for the skin. You can get rid of dry skin by using this ointment. Apply some Vicks VapoRub on your skin before going to sleep and massage properly. You will feel the magic the next morning. Keep repeating this to get rid of dry cells. If you are suffering from tennis elbow, then you can use Vicks VapoRub to get rid of the pain. The active components camphor and methanol helps in giving you relief from the pain. Keep applying Vicks VapoRub till the pain gradually eases. Vicks VapoRub is most commonly used to get rid of nose and chest decongestion. In case of chest congestion, take some of this ointment and apply it on the upper chest area. This will give your relief from the congestion and help you breathe better. In case of nose and throat congestion, apply some ointment externally on your nose and throat and inhale the vapor. This will give you relief from cough and nose block. Racehorses often get diverted by the alluring smell of mares and female ponies. During the day of race, professional racers rub some Vicks VapoRub on the nostril of these racehorses. The strong stench of this ointment prevents the stallions from getting distracted and keeps them focused on the race. Eczema is a skin condition where areas of skin become red, cracked, rough and itchy. It can also cause blisters. Vicks VapoRub helps in treating Eczema. Apply some of this balm on the affected patches of the skin. This will help in reducing inflammation and give you relief from pain and itchiness. A wart is a raised bump on your skin which is caused by Human Papillomavirus (HPV). Warts are generally caused by a type of viral infection. In this type of infection, the top layer of the skin grows rapidly and forms a wart. Usually, warts go away on their own but it may take them few months or years. Vicks Vaporub is seen as an ointment that can help you in getting rid of this viral infection. Take some Vicks VapoRub from the jar and apply it on your warts. After application, cover that area with some gauze. If the warts are on your feet, then cover it up with socks. For any other skin area, wrap the area with a cloth. Repeat this procedure twice a day and continue for around 2 weeks till the wart is gone completely. Athlete’s foot is a type of fungal infection that affects the skin on your feet. This infection is contagious. It can also spread to toenails or your hands. VapoRub can help you heal athlete’s foot faster. Rub some of this ointment on the affected portion of your skin two times a day. Continue this procedure till you get rid of this fungal infection completely. Humidifiers generally help by adding moisture to the air thereby preventing dryness that can be the cause of skin and body irritation. Vicks VapoRub can be used in few special types of vaporizers and humidifiers. But you do have to confirm that your humidifier or vaporizer has an aromatherapy section. The humidifier will spread Vicks VapoRub in the air and help you breathe ease. Are you an actor? Do you need to shed tears on stage and not able to do so? Vicks VapoRub can help you do that. Just pat small amount of Vicks under your eyes and that will help you tear up naturally.